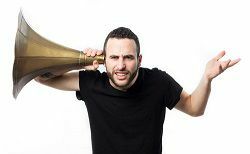 The image of a senior citizen with bulky hearing aids crankily demanding others to speak up no longer fits the profile of a typical person with hearing loss. More and more young people are gradually losing their hearing and, while they may be reluctant to seek help, their lives could be greatly improved with a visit to a hearing care center. Learning that they are not alone may just be the encouragement they need to get help. While one in three people over the age of 65 experiences some level of age-related hearing loss, 20 percent of all Americans report compromised hearing. That means that many of the 48 million Americans with hearing loss are well under the age of 65. And these statistics are based on reported cases of hearing loss, so they don’t even include the people who suffer in silence, too embarrassed to tell anyone that they are struggling to hear. Many of the unreported cases of hearing loss occur in young adults between the ages of 18 and 35. Understanding the causes of hearing loss among young people could begin to remove some of the stigma associated with hearing aids and other therapies. There are three main categories of hearing loss: conductive, sensorineural, and a combination of the two. Hearing loss in younger adults can fall into any of these categories. Treatments for conductive hearing loss can include medications to clear up infections, surgery to remove foreign bodies or to correct structural abnormalities, and hearing aids. While some forms of sensorineural hearing loss can be treated with medication or surgery, the most common forms are irreversible and may be managed with hearing aids or, in extreme cases, with cochlear implants. People of any age can experience any of these types of hearing loss, but many forms of conductive hearing loss are diagnosed at birth or in childhood. Problems with chronic ear infections or allergies are also often diagnosed and managed at a young age. Many of these sources of ear-damaging noise put young people at a particular risk. People working in the construction or lawn maintenance industries, emergency responders, and members of the military are all exposed to damaging noise on a daily basis. In fact, according to the Department of Defense, the most wide-spread injury for veterans is hearing loss caused by exposure to loud noise and head trauma. On top of work-related hazards, the use of noise-canceling headphones and earbuds by young people is also a source of hearing loss. Certainly, not all hearing loss is preventable. Protecting your ears from loud noises in the workplace and turning the volume down when you listen to music can prevent hearing loss in many young people, but many people have no control over their hearing loss. You do have control over what you do about the hearing loss, however. Contact one of our hearing care centers to find out how we can help.